To be fair I can understand why they scrapped the bone giant since we already have your cheap anti-infantry terror unit (Scorpion), the monstrous artillery (Ushabti with bows), the powerful anti-infantry monster (War Sphinx), the powerful anti-large monster (NecroSphinx) and the anti-lord/hero monster (Heirotitan). And then someone on Reddit beat me to the discussion, CURSES! Is there more then just the concept art? i didnt play table top, but maybe he could be some T2-3 monster in order to fill the gap of Tomb kings roster ? I feel like the distance between your skellies and finally good monsters is too big. i was not particullarly bothered by its absence but this makes me a bit sad. I do wonder whether the Bone Giant would count as an undead or a construct. 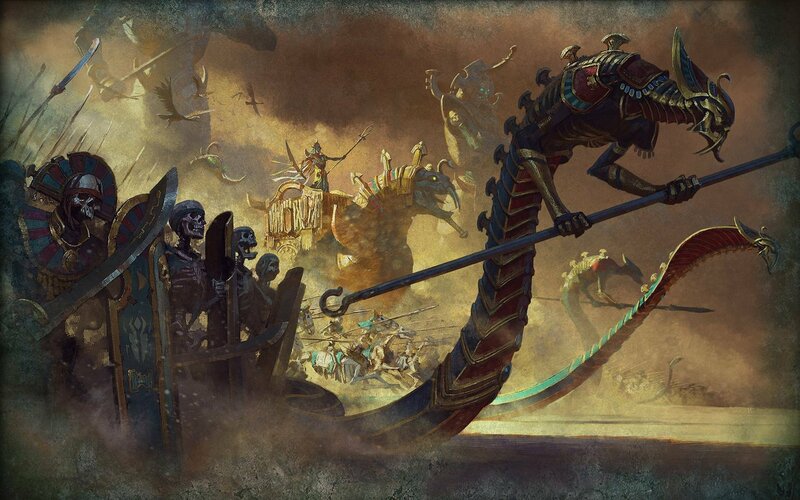 As an undead, to me, it would imply the Tomb Kings are resurrecting giant skeletons (something I don't think they really do). Whereas, if it was a construct, it wouldn't fit into the theming of the other constructs being sphinx and humanoids. Perhaps if it looked more like the giant stone mummy statues they have around their settlements. I assume in the tabletop it counted as an undead, but that was before the Tomb Kings gained their theming of having animated statues. I would guess the Ushabti used to be undead as well but I'm not sure. "The Necrolith Colossus, or Bone Giants[1a] as some have called them, are mighty statues of venerated heroes and ancient kings who stride to battle with massive weapons of war, towering over the Undead legions of ancient Nehekhara and the Tomb Kings. Made to resemble immense heroes of old, Necrolith Colossi stand noble and proud. Their forms are covered in skulls, bones and mortuary ornamentation. Indeed, such was Nehekhara's obsession with death and immortality that some Colossi have even been carved to resemble giant skeletons. Breastplates, vambraces and sometimes great crested helmets were hammered onto the stone bodies of these constructs, each lavishly decorated and engraved. [2a]"
Would've been nice, but as is the TK are packed to the brim with monsters. Seems like they intended to put it in but just couldn't figure out a way to include it with its cooler brethren. Is there any chance we could discover Ghorgon concept art as well? There are miniatures, yes. In fact, the Bone Giant as it was called initially was the first big monster in the roster (by big I mean bigger than the ushabti) and the only one they had before their 8th edition codex. He's the OG, so to speak, which is why it was a bit sad to see him not included at the cost of his "younger brethren." I would love to have it in. As cheaper and faster/less armored and probably hard hitting Hierotitan. "A Bone Giant is a Tomb Kings animated construct. It consists of bones of desert creatures bound together with wood and metal, as well as with the magic of Liche Priests. While their strength, bulk and speed are similar to that of regular Giants, they benefit from the bronze armour and weapons of Khemri. Also, being Undead constructs, they lack the wild and unpredictable nature of a living Giant and simply obey orders from the day they are created till the moment they are felled in battle. Bone Giants are representations of legendary creatures said to walk the earth long before records began with the foundation of the Mortuary Cult. As the priests of the cult grew and learnt, increasing effort was put into creating creatures to imitate these legends and the Bone Giants were born. Bone Giants are made to resemble the warriors of Nehekhara and most are many thousands of years old, it being rare to create new Bone Giants. If a Giant is destroyed in battle, its parts are gathered together in order to recreate it. Bone Giants are often seen outside of city walls, guarding entrances and defensive areas. They will react to any who come near without the need of a Liche Priest to summon them, such is the magic that goes into their make-up. " Another confusing point was the models were always painted to look like bone. 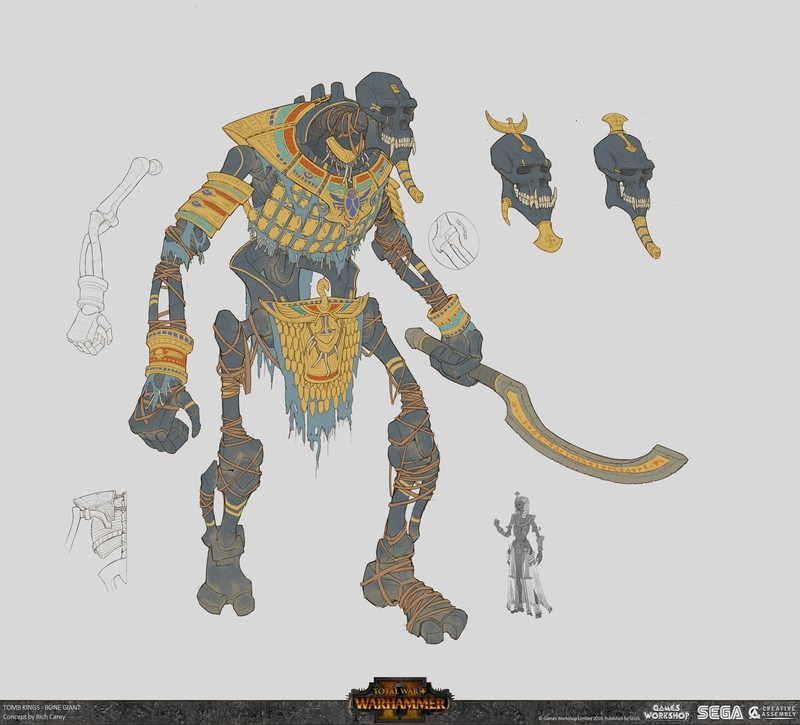 I agree now they would be considered a construct, that makes sense with the newer themes of the Tomb Kings, but visually it's still from when it was an undead construct. The model didn't get an update to go along with it's new lore. It seems like Creative Assembly tried to remedy this in the concept art, by making it look like it's carved out of dark stone. However, visually it's still a large skeleton, kind of out of place amongst the other contructs. If u look at the top left of the official loading screen when u play Tomb Kings in the campaign, it Looks like a Collosus, wich is even bigger then the Hierotitan and according to the table top was the first and the biggest. Looks to me they were very close of putting this in the game and maby they will with DLC's in the future. Would be nice since it would be the first undead giant in the game and with a greatbow it would be epic and very unique. I personally wouldn't really count on Colossus making it into the game as FLC anytime soon. Tomb Kings are DLC faction after all, alienating "non-premium" part of the community is just asking for a backlash - as unreasonable as it might sound. I can see it maybe being included as a part of a bigger update however - being a unit from the so-beloved by CA undead faction is certainly an advantage in this situation. @Marker Indeed, it looks like the variation with Dual Swords, so maybe as a FLC later on? That is just a Hierotitan, you can tell since it shares the exact same lower body and ornaments - something the colossus wouldn't have since it was more of a skeleton. The other one is also lacking his scales and is probably wielding his staff two-handed the same way. They are also the same size as the other one is further away :P.
I would give it a sword and shield to differentiate it from the other constructs in the roster. Give it no bonus vs anything making it a generalist. I would also add the bow version with bonus vs large. It might well make it in with the desert pictured FLC. And now the picture has been removed from Rich Carey's profile. CA please don't punish him harshly, no one was fired after the July RoR leak on the DLC factions. You know I saw this and was accualy planning on making a thread about this, but I kept it as something to look forward to, as something to be excited for..... You might of just ruined that...... poor artist. I will take one with bow, please. Of course I expect dual wielding variant to come as bonus. Can't think why CA would get snitty over a piece of concept art for a unit they don't intend to add, so maybe this should gladden the hearts of its fans. Damage control. Cut units are a bigger thorn than non-consentual units. If it never gets added it throws more fuel onto a fire. One can only hope it might get added as FLC simliar to harpies for the Beastmen altough I somewhat doubt that...so really bad it didn't make the cut. The concept art looks great. It's gotta be a Chocolate Jesus to keep me satisfied. They can add it as more cheap, fragile, but more quickly, big construct, before the last tier, with the bow variant in the last tier. 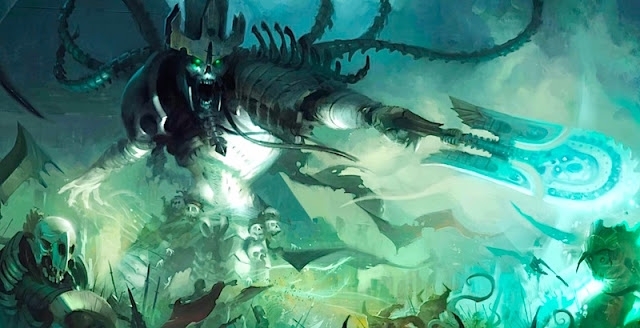 Maybe one day if we ever get like an End times like expansion (hear me out), sort of like another version to ME but with the more story involved, that comes with one or two new units and a lord for all existing factions. If they add bone giants to tomb kings for example with Nagash. I dont know if that would be popular but it would be great to see this guy at some point.